Michael Jaime Becerra. Photo courtesy of Becerra.Michael Jaime Becerra, associate professor of creative writing at University of California, Riverside, said a sense of place and trust in his characters are the keys to his writing success. 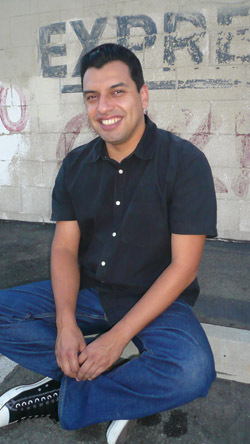 Michael Jaime Becerra, associate professor of creative writing at University of California, Riverside, said a sense of place and trust in his characters are the keys to his writing success. It is this El Monte that anchors his collection of stories, “Every Night is Ladies’ Night” (Harper Collins, 2004) that brought Becerra critical success. It was named one of the best of the year by The Washington Post and the San Francisco Chronicle and was awarded a California Book Award, the Silver Medal for a first work of fiction. Becerra appears at 2 p.m. on Sunday, June 3 for Eduardo Santiago’s Author Series at the INK Bookstore on North Circle Drive. The series is free to the public and is located this year in back of the bookstore.